Changes in my life mean I'm back to flying more often. The couple of years away from frequent air travel has reminded me how much it has changed. The Pittsburgh Post-Gazette has a very good retrospective on the "new" airport - and how the world changed in less than a decade to make for a decidedly less ambitious current state. The "new" Pittsburgh International was unique in its time - I liked to call it the most secure shopping mall in America, since, before "9/11," anyone could come in and peruse the scores of shopping mall-type stores at the AirMall. I recall buying my first sound card for a computer at PIT while on a visit with my sons. 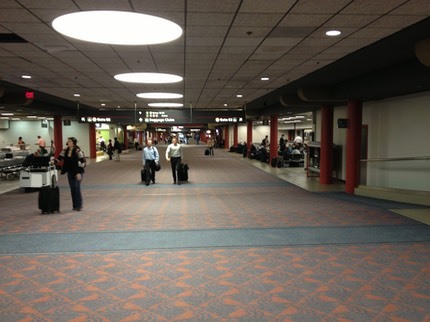 In January 2001, NPR's All Things Considered sent an entire production team to Pittsburgh International to follow what went on in the course of the 24 hour workdays at what was still, then, a very busy airport. This NPR project was about a dozen years ago. It is interesting to hear how much like every other airport operation PIT was back then. It is a transit hub, so there are things that have to be done. People working at 3 in the morning face many common issues, so this was a good, generalized set of stories. PIT was still very busy with USAirways traffic, there were many direct flights. 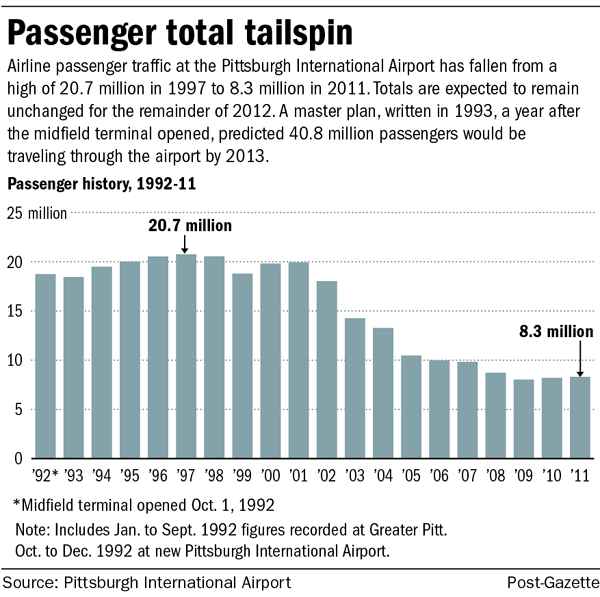 The events of 9/11 were still many months away - and the subsequent downsizing of airline activity in Pittsburgh. I remember coming to the "new" Pittsburgh International not for a connecting flight, but for business. That trip took a very sad turn the day I arrived. The crash of USAir flight 427, near the airport, took 132 lives in September 1994. This was less than two years after the opening of the new terminal. This was also not long after the Pittsburgh newspaper strike of 1992-93, which changed the landscape of media in that city. The media coverage of crash of flight 427 was a bellwether event for a city ready to head into yet another era of change. The much investigated accident led to changes in how all Boeing 737's would be maintained, too. 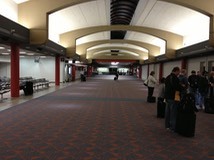 Fast forward to now, and Pittsburgh still has a fairly busy airport for a community of its size. It just isn't as busy as what planners had expected. 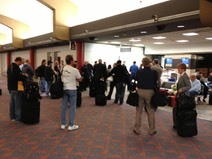 PIT appears to now be serving fewer travelers than Cleveland-Hopkins International. I now live in Birmingham, AL, where the Birmingham-Shuttlesworth International Airport is the largest in the state with about half the traffic of PIT. Which brings me to a topic I hadn't thought of at all when I first contemplated writing this post, As of this week, the Birmingham News is changing, too, cutting print editions from 7 days a week to three, and renaming the enterprise the Alabama Media group. My station, WBHM, and our Junior Advisors Board is holding an "Issues and Ales" event this week, bringing together media experts of different backgrounds to discuss what is next in the realm of information and journalism in transition. Hope to see you there - as we get started on the future. John Lennon wrote, "Life is what happens while you're busy making other plans," and I tend to agree. But if you are paying attention and choose to act, perhaps you can have a role in whatever comes next.